A YMCA childcare worker slipped on an icy patch of the sidewalk after finishing her shift. The long-time employee had severe arthritis which made cushioning her fall extremely difficult. After hitting her face and body on the cement, she had to be taken via ambulance to the local emergency room. Fortunately, after a variety of x-rays and scans no critical injuries were discovered. She was lucky to escape the fall with only minor bruising. Day-to-day operations don’t take a back seat during the winter months. 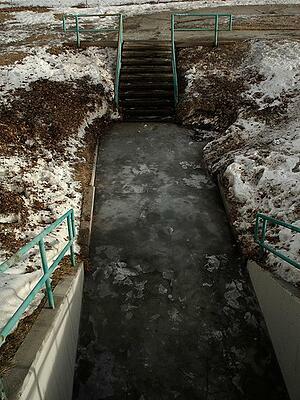 Ice and snow means increased slip and fall exposure, and West Bend claims representatives can attest to that. Our worker’s compensation and general liability adjusters see more claims in the winter months than at any other time of the year; it should come as no shock that a high percentage of their winter workload is the result of weather-related slips and falls. While you do the very best you can to keep your parking lots plowed and your sidewalks shoveled and salted, despite your best efforts, you won’t be able to keep your premises 100% slip-free. You can protect your patrons and employees, however, by considering these recommendations. An analysis of claims from last winter show that children, the elderly, and the disabled have a disproportionately higher frequency of slips and falls in the winter months. Most buildings are already required by federal law to offer handicap parking, but offering additional reserved parking for the elderly, families with young children, and expectant mothers is a great and inexpensive way to mitigate winter falls. This offering can be seasonal or permanent; just make sure you clearly display your intentions. Most community orgs contract out their snow plowing with a local contractor. After obtaining certificates of insurance, it’s important to sit down and put together a thorough snow removal action plan. Clearly identify when the contractor should plow and where the snow should go. Be sure to tell them when your parking lot has the most traffic and your typical hours of operation. While many business pay to have someone else plow, many organizations shovel their own sidewalks and walkways. From a cost standpoint this makes sense, but this opens you up to increased liability and injuries to employees. Keeping a shoveling and salting log is a great way to minimize liability. When you can show your employees did their best to stay on top on shoveling and salting, most courts will dismiss frivolous claims arising from slips on ice. Also remember to clear all emergency exits in addition to the main access points. Teach employees proper techniques for shoveling and salting to prevent repetitive motion, back, and shoulder injuries. 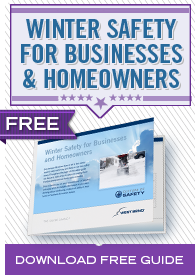 Despite your best efforts, a winter weather slip-and-fall injury could happen on your premises. If a patron or employee reports they’ve fallen on your sidewalk or in your parking lot, investigate the allegation immediately. Identify exactly where the fall occurred and consider taking pictures. If ice or snow did contribute to the fall, shovel or plow the area as soon as possible. If there’s no clear indication of ice or snow, make a note of the last time the area was plowed, shoveled, or salted.